Buy Bional V-nal ® Cream - 75ml in the UK from our online shop or directly from our independent Scottish store. V Nal cream can be used for beautiful, smooth and healthy legs and feet. V-nal® Cream is a unique, ‘non fat’, herbal cream specially designed to provide the optimal care of your legs and feet. Certain situations such as standing for a long period of time, travelling, lack of exercise, being overweight and pregnancy place a heavy burden on your legs and feet. This soothing cream prevents your skin from drying out, recuperates and relaxes your legs and creates a refreshing feeling. V-nal® Cream can be used to massage tired legs and feet as well. V-nal® for beautiful and graceful legs that keep you light on your feet. Aqua, Isopropyl Palmitate, Alcohol, Palmitic Acid, Cyclopentasiloxane, Glyceryl Stearate, Simmondsia Chinensis Seed Oil, Sodium Dihydroxycetyl Phosphate, Stearic Acid, Tocopheryl Acetate, Ethoxydiglycol, Allantoin, Ruscus Aculeatus Root Extract, Aesculus Hippocastanum Seed Extract, Titanium Dioxide, Hamamelis Virginiana Leaf Extract, Polyacrylate-13, Parfum, Bisabolol, Xanthan Gum, Hydrogenated Palm Glycerides, Propylene Glycol, Polyisobutene, Aloe Barbadensis Leaf Juice Powder, BHT, Phenyl Ethyl Alcohol, Citric Acid, Polysorbate 20, Sorbitan Isostearate, Methylisothiazolinone, Iodopropynyl Butylcarbamate, Sodium Chloride. We sell real Bional and other Joint & Leg Care directly from our shop in Scotland and online throughout the UK. View more products from Bional. Where can you buy real V-nal ® Cream safely online? If you are wondering where you can buy Bional V-nal ® Cream - 75ml safely online in the UK, then shop with us. We are an actual health foods shop; with real people selling real foods and products. Our award-winning independent shop is located in Stirling, Scotland since 1976. You can buy our Joint & Leg Care in store or safely place an order with us online or over the phone. 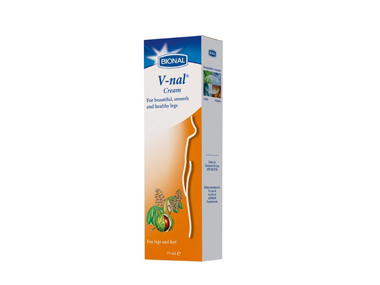 V-nal ® Cream - Bional V-nal ® Cream - 75ml in Joint & Leg Care and Medicinal Skin Care.